Single Sign On – is a technology that lets the user authenticated on Identity Provider (further IdP), be automatically authenticated on another service (further Service Provider, SP or Consumer[1-N]) of the company. User enters pasword only once during the session. Or doesn’t enter the password on IdP at all, if he is logged in via social service or OpenID. User is automatically authenticated on all company’s projects. User’s data can flow transparently from IdP to SP. Loss of IdP password implies the problem of signing in on all other services. Potentially increased risk of theft of the IdP password. From business point of view and UX the pros outweigh the cons and companies usually decide to implement Single Sign On. and how to exploit it. This is important because a wrong implementation of SSO, may lead to critical errors in all services that are connected to this SSO. For example user data compromised in one service or stolen IdP account entail data compromise in all services. After getting familiar with basics: what is SSO and its security aspects you can proceed to implementing Single Sign On. After the registration he should be redirected (point 3, green line) to his last SP for OTP validation. When OTP is being validated, SP makes trusted REST request to IdP to ensure that OTP really exists and didn’t expire. At this point REST API should invalidate this OTP. You have to acquire a lock because this operation should be atomic. Further requests with this OTP return either HTTP 400 or HTTP 404 for SP. In case IdP confirms that this OTP exists and is valid, SP authenticates the user by creating PreAuthenticatedToken. Note that we assume here that the logout was initialized on SP. This is important because user will be redirected to this SP. Lets Imagine that user is on some page /secured_area and clicks “Logout”. At this moment local logout happens on SP. Then the user will be redirected to IdP on special URL /sso/logout that will manage the logout flow from all other services. As soon as the user has come from SP, IdP selects next SP for logout and redirects the user to it. 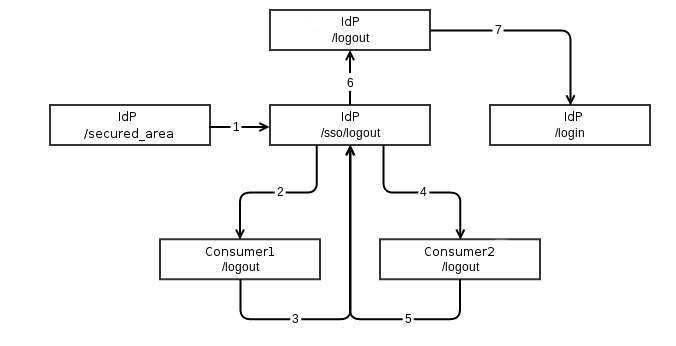 The second SP upon completion redirects user back to IdP and in case there is no more SPs to logout from, does a local logout (point 5 on the scheme). After that, user is redirected back to SP where he began the logout. To implement IdP you should choose an application in your company that will be responsible for it. Like it is done in Google (Google Accounts) or Yandex (Yandex.Passport). sso_identity_provider.otp_manager – Manager to work with OTP-tokens. Validation, invalidation and receiving. sso_identity_provider.uri_signer – Service for signing URLs, if you need to redirect users to /sso/login yourself. When configuration of IdP is completed the next step is configuration of SP-part. To get “true” Single Sign On, you should choose http method as manager, and service – as a provider. For this you have to implement Krtv\SingleSignOn\Manager\Http\Provider\ProviderInterface interface. sso_service_provider.otp_manager – Manager for working with OTP-tokens. Checking and receiving. sso_service_provider.uri_signer -Service for signing URLs, if you need to redirect users to /sso/login yourself. The configuration of applications is completed. This article is absolutely fantastic, as are the Symfony2 libraries. We’ll certainly be giving it a shot; thanks for all of your hard work! Hello, I have implemented your SSO project 0.3 versions, with symfony 2.8. I have been debugging SP and idP, it almost work to the end, but there is problem with UriSigner, and on both sides Malformed uri exceptions are produced. Have you noticed this problem already, it seems that _hash is not properly detected while it duplicates on idP. If we can talk about this problem, I can provide a fix for it and later push request. Implemented that on my sso project, works like a charm! Thank you! One should not assume that acronyms are understood by everyone. There are those, myself included, who want to understand this but do not know all the terms. For example, if OTP means one-time password, then say that and include OTP in parentheses following the full text. Later use of the acronym then becomes meaningful. The article becomes substantially more accessible when terms are defined. thanks a lot for this article and your bundle. Juste one thing. How can we handle the ROLES of the connected people. Are the credentials transmitted with the OTP ? It’s not very clear to me. What is the best practice ? We did it during server-side request, when validated an OTP. You feel free to define your own model for OTP result and OTP validation handler. Hope it will help. Can I also use this bundle to implement the SSO in an IDP built in Symfony and an SP that is non-Symfony? Hi, you could use https://github.com/korotovsky/SingleSignOnLibrary and implement same logic for your non-Symfony application. Experiencing this error when SP makes request to my IDP server. Anyone know where the problem could be? This set of bundles does not support integration with SAML IdP. I did setup a symfony app as IdP and another as SP as described. SSO works well for logout (when I logout from SP I am logged out at IdP as well). But SP does not notice when I am logged in at IdP. The fm_otp table in my db is still empty and untouched. When you visit SP, you have to setup ACL in a way to force Symfony execute an EntryPoint. Basicly https://github.com/korotovsky/SingleSignOnServiceProviderBundle/blob/0.3.x/src/Krtv/Bundle/SingleSignOnServiceProviderBundle/EntryPoint/SingleSignOnAuthenticationEntryPoint.php#L47 this code have to be executed to obtain authentication cookies on SP. Now it works well but I have to set anonymous:false for the firewall. Is there a way to allow anonymous login and create a link to SSO? There is no ready-to-go solution for that. But if you understand how SSO works internally, you can build this link, yes. Here is an example, because I had exactly the same use-case. 1) throw Symfony\Component\Security\Core\Exception\AccessDeniedException(). It will triggeran built-in entrypoint and redirects user to SSO login endpoint. Now I have a startpage that allows anonymous and login url is redirected to sso. Great! Feel free to contribute to this bundle. Thanks for your feedback. Please delete my last post cause something went wrong with it. I can send you the files if you want. Thank you for your contribution with your excellent code. I am impressed for your SSO solution and decided to adopt the code into Mautic plaftform. As you know, Mautic is a representative Symfony project. So we are going to implement Mautic SSO and found your solution with Symfony. But I have obstacle to migrate your symfony code to Mautic. I have made your code as a Mautic plugin, installed the plugin into Mautic. Mautic customized configuration style, I have difficulty to config security.php because it is so different with original Symfony form. When I add sso into main firewall and set provider as user-provider. Mautic made error “Symfony\Component\Debug\Exception\ContextErrorException: PHP Error – Argument 1 passed to MauticPlugin\MauticSingleSignOnBundle\Authentication\Provider\OneTimePasswordAuthenticationProvider::__construct() must implement interface Symfony\Component\Security\Core\User\UserProviderInterface, string given, called in C:\work\mautic\app\cache\dev\appDevDebugProjectContainer.php on line 14896 and defined”. I debugged many times to find solution but I was not familiar with Symfony, so I still couldn’t find the reason. I will be appreciate you to help me to find a right solution and give instructions on it.